It's time for a new-scale freedom that overcomes borders! 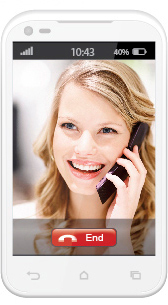 Make calls and text in Europe just like in Latvia! Tariffs in € per minute, per text message and per 1 MB or for a specific Internet allowance, incl. VAT. Calls to local toll-free, premium-rate or additional service numbers in other countries, as well services on ships and in satellite communication networks are charged according to the price list of the respective foreign operator. On vacation, on business, in a neighboring country or another continent – use your phone abroad just like at home! 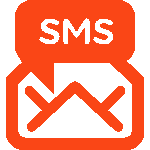 You can make calls and send text messages in networks of 446 operators from 206 countries in Europe, Africa, Asia, Oceania and the Americas, as well as on ships and via satellite communication networks. And the Internet in Your Phone can be used in networks of 375 operators from 174 countries. This option – visiting the networks of other operators – is called roaming. Before you leave, please study the tariffs and read about using your phone abroad or close to the border. To be on the safe side, when you arrive, we will send you a text message with information about tariffs in the respective country. You can use My LMT to adapt the receipt of these texts to your needs. Roaming as an optional service as of 01.07.2014 You also have a right to use the services of other roaming operators. More information HERE. You can make and receive calls abroad, as well as send and receive text messages and MMS – just remember about some important aspects. Before you leave, please make sure that your tariff plan and phone can be used in the country of your destination, and please study the applicable tariffs – enter the country in the menu at the top of the page. Enter all numbers in an internationally standardized format (to Latvia beginning with +371). To make it even more easier, save them in your phone in this format! Please remember that Internet rates of the respective operators apply to data traffic consumed by all MMS messages sent or received abroad. If you would like to stop receiving MMS–, please text MMS to 1688. 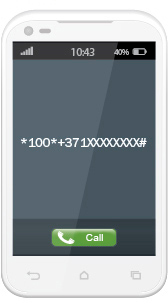 When you return home, do remember to reactive this function by texting MMS+ to the same number. Use LMT-friendly tariffs that we have marked with a smile :), when you travel abroad. They offer the best rates! If you would like to save, use CALL-BACK to call Latvia and other countries. Find out how the charges are calculated. No need to change your habits — use the Internet in you phone, computer or tablet abroad just like at home! Information on the internet consumption is always available here: info.lmt.lv/internets. Bear in mind that this option is available only by using LMT mobile data (in Latvia and abroad). You have a specific Internet allowance available to you in all EEA countries at no additional charge, if you use one of the following: INTERNET VIA HANDSET, MOBILE INTERNET IN COMPUTER OR TABLET, PRE-PAID MOBILE INTERNET, WEEK FOR INTERNET or WEEK FOR INTERNET+. The Internet allowance available to you** is indicated in the tariff calculator. When you have consumed your Internet allowance, keep using the Internet at an additional charge – enjoy options provided by the INTERNET WHILE TRAVELLING! Monthly allowance in EEA countries may be used until the end of a calendar month at 23.59 Latvian time. Enjoy the wonderful possibilities offered by the INTERNET WHILE TRAVELLING – internet is available at once (GLOBAL 1 – 1 GB, GLOBAL 2 – 500 MB, GLOBAL 3 – 100 M) at a minimum fee and an accounting step of 32 KB per 0.0312 € until you reach a 13 MB or 12.99 € limit. Amount expiry date – 15 days from the date of starting up the internet until the last day 23.59 Latvian time. In countries where no Internet While Travelling is available, use the charge per MB option. Depending on the network used three tariffs are available – 0.99 €/MB, 4.99 €/MB and 14.99 €/MB. Information on the tariffs in the networks of the respective operator is available in the tariff calculator. What Internet do I have? While in EEA countries and start using the INTERNET WHILE TRAVELLING or after the consumption of the purchased allowance, you will receive a text message and a new page will open in your Internet browser offering to purchase additional data. You will also be able to activate the INTERNET WHILE TRAVELLING+ and never worry about purchasing additional data allowances again. When you start using the INTERNET WHILE TRAVELLING outside the EEA countries (GLOBAL country group) you’ll get internet at once. When the first allowance is used, a new page will open on the internet browser with the possibility to purchase next data allowance. Irrespective of the country, you can control your monthly spending for the Internet abroad and avoid huge bills – this is why we provide CONTROL OF MONTHLY COSTS with regards to the Internet abroad. The unconsumed data allowance of the INTERNET WHILE TRAVELLING will not be available after its expiry date or in a different country group. If you would like to consume data in several country groups, the charge will apply per group. Internet tariffs abroad may be higher than in Latvia, especially if you have chosen to be charged per MB. Remember that it is not possible to use the data allowance included in LMT Internet plans beyond the EEA. Before you travel abroad, please check the tariffs in the country and network of your destination — use the menu at the top of the page! Find out more about the Internet abroad. * Send a command now if you would like to subscribe to this service for the listed price. Information about consumer’s right of withdrawal. In case of a one-off purchase, the service is provided immediately, and there is no right of withdrawal. ** In other EEA countries outside of Latvia the fair usage allowance is determined pursuant to the EU Fair Usage Policy and the EU Roaming Regulation. This allowance changes from time to time. Please check the LMT homepage or tariff calculator on regular basis when you choose your tariff plan. When you travel to non-EEA countries, it is always less expensive to call Latvia via a call-back – save up to 64%! It is also quite easy and convenient – just dial a specific combination with the number of the recipient and wait for a call-back! Unlike a direct call, when you call Latvia via a call-back, you can dial the recipient’s number according to the local (*100*XXXXXXXX#), as well as international standard (*100*+371XXXXXXXX#). But calls to other countries should always be made according to the international dialing standard. Receive a call-back and speak! You can use call-back to call Latvia or other countries, just make sure that this option offers a better price. Enter the country in a menu at the top of the page and check the tariffs! As call-back numbers are not saved in the list of calls, we recommend to save the required numbers in your address book in a call-back format to be able to make your calls easier! If you travel to the European Economic Area (EEA) countries, use direct calling for local and intra-EEA calls as it will allow to save money! You can find out more about CALL-BACK here. Irrespective of your country of destination you can be sure that your Internet costs will not exceed the limit that you have chosen! The EU has imposed 60.00 € as a credit control limit on the use of Internet abroad, but you can also choose your own amount. If you find the EU credit control limit acceptable, no other amounts should be sent to us. But if you would like to spend less or more, e.g. you need a higher limit, it is also possible. You can choose a specific amount: 35.00 €, 60.00 €, 70.00 €, 100.00 €, or 140.00 €. Legal entities and corporate customers may choose a larger amount. But do remember that this limit may not exceed your maximum cost control amount applicable to the use of Internet abroad, as well as your total credit limit. Choose the easiest way to sign up! By texting VGL to 1688 – you will sign up to the maximum cost control limit. Text VGLx to the same number, indicating the chosen amount instead of x. For example, by texting VGL100, you will be able to spend 100.00 € on the Internet abroad. Come to the closest LMT customer service center or store. You will receive an informative message before you have reached your cost control limit, as well as when you have reached it. It means that until the end of the respective month you will not be also to use the Internet abroad. Other services will be available to you. If you wish to resume your Internet use, please increase your monthly cost control limit, e.g. by sending a text message to 1688. If you would like to keep the same cost control limit, nothing has to be done – Internet access will be restored at the beginning of the next month. The easiest way to find out what amount you can spend on Internet abroad is to log into My LMT. You can also send a text message VGLI to 1688 or ask at the closest LMT customer service center or store. If you have several LMT numbers registered in your name, you can either chose to impose the same monthly Internet limit on all of them or a different limit on each number. If you use a device that does not allow to receive text messages (for example, Apple iPad), the notification can be sent to an alternative number! In this case you have to contact us or come to the closest LMT customer service center. When you travel abroad, take your LMT Karte along! You can use it almost everywhere – in 189 countries and in networks of 369 foreign operators in Europe, Africa, Asia, Oceania and the Americas. And the Internet can be used in networks of 322 operators from 165 countries. Tariff plan WEEK FOR CALLS is available only in Latvia! If you would like to use your phone abroad, sign up to the tariff plan BASIC RATE. When you indicate that you would like to be charged per one MB, other data transfer services will be disconnected (if any), for example, WEEK FOR INTERNET. Charge per one MB will continue to apply in Latvia and in other countries, while you sign up to the WEEK FOR INTERNET or the WEEK FOR INTERNET+. In this case Internet in Travel will also be activated. Make sure that you have enough money in your LMT Karte account before you leave – mobile devices can be used abroad only if at least the minimum charge is covered. *This option is available only in networks of specific operators. Services used in other countries are chargeable depending on the region and the network of the chosen operator. Enter the respective country at the top of the page to find out the applicable tariff. Make sure that you use an LMT-friendly network with a smile :) It will allow you to make considerable savings in non-EEA countries! BE PREPARED BEFORE YOU TRAVEL ABROAD! Only an activated LMT Karte may be used abroad. A new LMT Karte kit could be activated abroad by making a call or sending a text message. Find out in advance, which foreign networks support the LMT Karte. Not all foreign operators provide call-back, direct calling, Internet and LMT Karte account management functionality. If for any reason you would like to discontinue using your LMT Karte abroad or start using it again, it is also possible. Find out how to do that and remember that it can be done only in the LMT network in Latvia. You can find out more about using your LMT Karte abroad here. from EEA countries – free of charge!